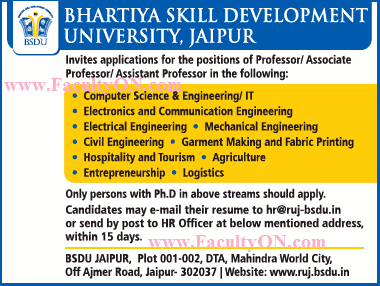 Bhartiya Skill Development University, Jaipur has advertised in THE TIMES OF INDIA newspaper for recruitment of Professor / Associate Professor / Assistant Professor jobs vacancies. Interested and eligible job aspirants are requested to apply within 15 days from 11th April 2018. Check out further more details below. About University: BSDU programs are in compliance with UGC Instructions for Vocational Programs, National Skills Qualifications Framework (NSQF), AICTE Instruction for Vocational Programs, NSQF RPL (Recognition of Previous Learning) Guidelines, Guidelines of respective Sector Skill Councils (SSC), National Occupational Standards (NOS), Skills Qualification Packs. How to Apply: Interested and eligible candidates are requested to send CV along with copies of certificates and recent PP size photo to the email address or postal address provided below.